Cold rain, forecast to change to sleet and snow overnight. So, I bandaged and booted and tacked and rain cloaked both man and horse and sang through the rain to the big gym. Although I could have used the RomperRoom adjoining the stable block, the horses have been confined to bending and stretching and balancing in that limited space, so many days this icy winter, that I take advantage of every opportunity to use the full-sized gym floor. This day, my partner expressed gratitude for the larger space. While I did my own bending and stretching and limbering exercises from the saddle, the horse inspected the margins at loose rein free walk, perambulating the perimeter, literally nosing into the very corners of the room, both directions. Then I picked up my stirrups, and developed contact at medium walk, carefully regarding the symmetry of my own position. I have found that with this horse, at this stage of his development, leg yield is the direct route to even contact. I don’t use LY, or any lateral work at walk, much, with most horses. But this individual has such a good, confirmed walk, that I do to worry about mucking it up. At this stage, his walk half pass is becoming delightfully adjustable with respect to angle and length of stride. So much of the bending and stretching and loosening is accomplished before we strike off into an energetic working trot, rising. A few circuits of the perimeter, changes of hand, big looped serpentines, smaller looped serpentines, and bigger looped serpentines with LY outward, and shoulder-in preceding and following a change of direction promote and confirm evenness of contact, and build impulsion. Then an interlude of walk work. For this horse I am confirming, through focused practice, the difference between turn about the hind quarters at medium walk, and half-pirouette at collected walk. Progress in this endeavor seems to depend upon my own concentration, I reflect. Then we struck off at canter. This day it took only a few strides to establish distinctly three beat activity. So our exercises soon included SI canter, counter canter, changes of lead through trot and changes of lead through walk, and a single change each direction, just to check signals. Then another walk interlude that included medium, collected, and lengthened segments. Then struck off again at canter. A serpentine on each lead, including counter canter loops as they came up, maintaining an uphill attitude. Transition to a long, energetic, forward and down trot, rising, inscribing a big figure eight, to stretch his topline. Then to working trot, sitting, and dropped my stirrups, and proceeded to lateral trot work. Riding without stirrups refines the application of my influences, making it easier to maintain rhythm and tempo, and promote throughness. This horse knows the language of the aids well, it is up to me to not interfere with his balance as he gets stronger and is able to execute an increasing number of high quality strides of the movements. It is good policy to straighten and ride forward at the first perception of loss of any quality in a lateral movement. But this horse also counts, as in “I have done three strides of half-pass left.” So I have to be judicious with the application of the policy, sometimes requiring another stride before straightening as a reward, in the spirit of a game rather than a repetitious drill. Often I do a true canter or counter canter loop just to refresh. 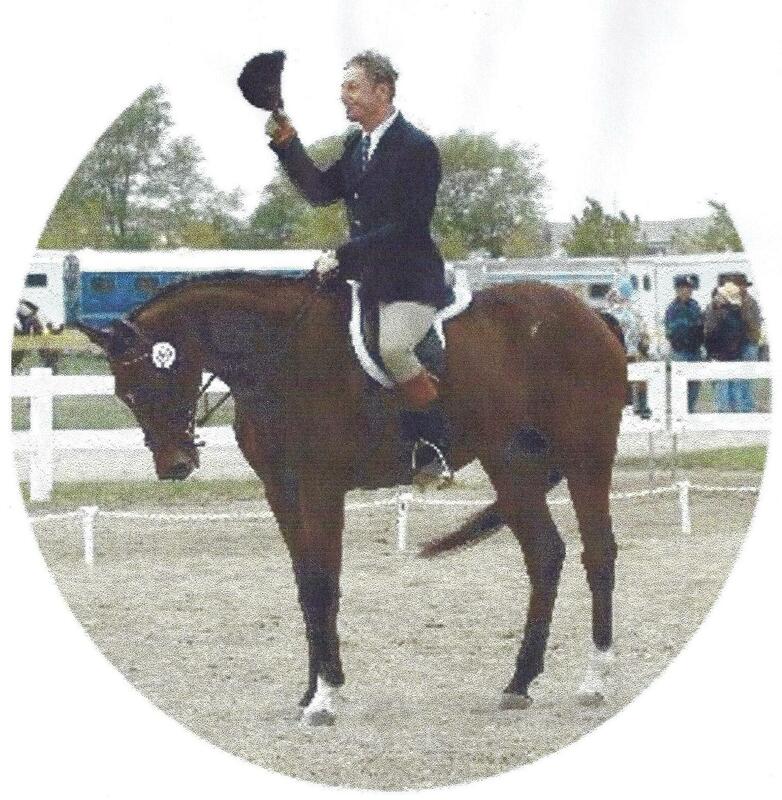 Taking advantage of the canter refreshment, I include flying changes at varying intervals of 15, 10, 12, and 7 strides, at “odd” locations on the floor, to prevent this smart horse’s anticipation. And SI and HP canter interspersed among the changes. Then regain my stirrups and transition to forward and down trot, rising. Then to working trot sitting, and a few more lateral exercises, significantly improved. Much praise! Then to walk….and warm down. For this horse, warm down now includes schakule, or see-saw, if you will. Establish medium walk, three strides of rein-back, five strides of medium walk, five strides of R-B, seven strides of medium walk, seven strides of R-B, medium walk to collected walk, to medium walk to permitting him to take the reins forward and down into a free walk and praise. The inclusion of collected walk is important here in order to remind this horse that a half-halt is only a half halt because the schakule causes him to anticipate halt and rein-back – he has taught me. After a few circuits of the court in free walk, realizing that his breathing is quite lovely and he is barely damp, I dismount, loosen the girth, release the flash, and rub his head, which he obviously loves. So much so, that it becomes his game to poke me with his muzzle and flip foam at me, to elicit my massaging response. So we play for a bit, then I lead him about a few minutes before donning the rain cloaks and returning, singing in the rain to the barn, to towel off and set fair.